This summer Asbury Park F.C. is teaming up with Asbury Park Yacht Club, Umbro, Topps, Andy Diamond and the New York Red Bulls to bring a thoroughly Modern Football experience to the world famous Asbury Park Boardwalk. Beginning on June 16th, Asbury Park Yacht Club will serve as ground zero for the Jersey Shore's most unique global soccer experience complete with live music, beach soccer, a pop-up team shop with exclusive Asbury Park F.C. merchandise and international soccer live and direct from Russia. Clubhouse kickoff extravaganza on Saturday June 16th featuring a New York Red Bulls beach soccer experience with small-sided games & The Playmaker skills challenge plus live performances by Mercy Union and Lost in Society. Custom trading card experience by Topps; get your face on an Asbury Park F.C. trading card. A June 24th appearance by New York Red Bulls players including Monmouth County native Sean Davis, Haitian International Derrick Ettiene Jr. and 2017 breakout player Aaron Long. A second appearance by New York Red Bulls players to be determined on July 7th. 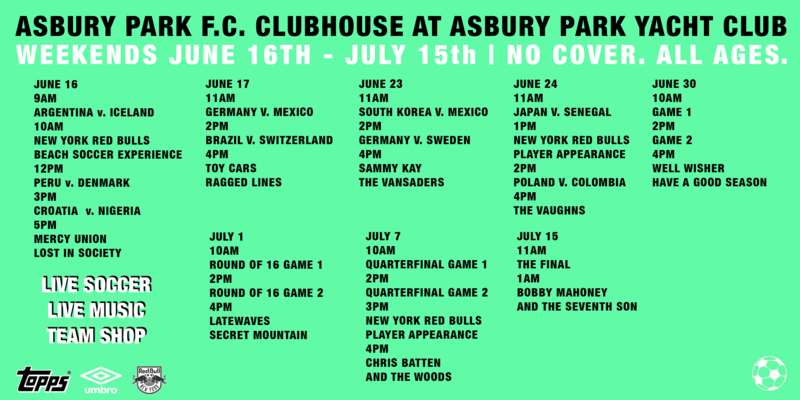 Check out the initial schedule of events below and follow Asbury Park F.C. on Twitter and Instagram for the latest updates.